You have 2356 characters. Don’t forget to add important and relevant keywords in your description to improve your iTunes app page and optimize your SEO. Your app's last version was released on June 28, 2017. It is important to regularly update your app. Best practices recommend to update your app every 4 to 6 weeks. This means fixing reported bugs, improving existing features, launching new features etc. Keep an eye on users' feedback. The next great features may already be asked by many users. 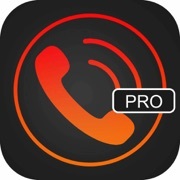 Automatic Call Recorder is the best call recorder app to allow you to automatically recorder all your calls. On top of that you can turn your iPad/iPod touch to an iPhone. The cheapest way to make international calls! 1. The first step is to verify your number. DO NOT enter the country code. Select your country's flag if it's not already selected. 2. If it's first time you are verifying your phone number, you will receive a call with instructions. Enter the six digit received in app screen. 3. If you have used this app in the past, you will receive a code via text message. 4. Press on Continue button. Now the app is ready for first call. 5. To record your calls, go to Payment screen, turn on the switch for Call Recorder feature. 6. After the call, go to Recording screen to see the new file generated. IMPORTANT NOTE: During the verification process of your number it's not necessary to add the country code. When you dial an international number, please select the flag first then add the number without the country code.